Present to a peaceful hunters? This was translated from another page that I found one of my feltidermy featured on. I found it through Google on Metrobloggen – Presentgurun, another Swedish site! It read: Present till en fredlig jägare? En smårolig present till jägaren – eller jägarens barn! – är “troféer” av filt, monterade på rejäla plattor, precis som jakttroféer ska vara. Dessa finns att köpa eller specialbeställa hos Girl Savage för runt $30 och uppåt. Which when translated in Google translate says: Present to a peaceful hunters? 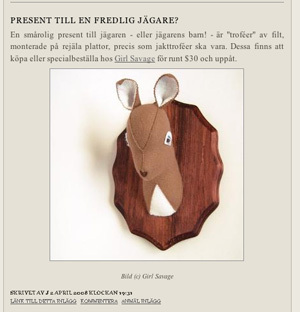 A smårolig gift to the hunter – or the hunter’s children! — Are “trophies” of felt, mounted on sturdy plates, just like hunting trophies should be. These can be bought or specialbeställa of Girl Savage for around $ 30 and up. and Bookish Mouse 6 Feltidermy. I also added a new Plush today! Emmet the Embossed Felt Deer is now waiting for a new home! He was stitched from royal blue, embossed felt and couldn’t be any cuter! Have a great day and thanks for stopping by! which in Swedish, according to Google translate is: Ha en trevlig dag och tack för att stanna till! ha ha ha and a BIG CONGRATS on this!